This one fits into the other kinds of food pretending to be a burger series. SPAM is so misunderstood by Americans. It is a thing of wonder, and not a thing to laugh at. Oh if only they knew that half the world survives on SPAM. I've made SPAM musubi in the past. SPAM musubi is basically SPAM pretending to be sushi. 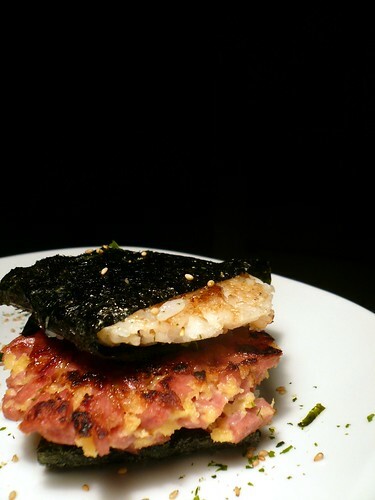 So this particular dish I cooked up is SPAM pretending to be sushi pretending to be a burger. How po-mo. I briefly talked about SPAM Rice Burgers when I made halibut burgers. There's a restaurant in Japan called Freshness Burger that makes a SPAM Rice Burger using a slab of SPAM and a "bun" made of rice. At first I thought this was genius until I figured out that their idea of a SPAM burger is really just a slice of SPAM sandwiched in a bun with few veggies tossed in. So when I first decided to do SPAM burger, I knew that I needed to mince the stuff to get the texture I wanted. This particular burger-like sandwich is based on the SPAM musubi. 1/2 can of SPAM, chopped up. Mix together the soy sauce and the sugar. Set aside. Mix together the chopped SPAM (I prefer SPAM Lite), eggs and breadcrumbs. Form these into buns and fry them over medium heat at about 3-4 minutes a side. Take your onigiri-yaki and sprinkle some furikake on it. Wrap each onigiri-yaki bun in the cut nori. Use the sugar-soy sauce mixture to "glue" the seaweed ends together. Lay your SPAM burgers onto the buns. That's pretty much it. It might be nice to brush some of the soy-sugar sauce on the SPAMburgers before putting the top bun on. I like it. It was great paired with a cocktail made from Mount Gay Rum, pineapple juice and muddled mint. Living in California and searching for a good bagel, I realized that many were baked-not-boiled. Today I write about things not entirely bagel-related. I also take pictures of things not entirely bagel-related. I occasionally get into random obsessive bouts of food-wackiness, like my thirty-one days of National Burger Month.